The Green Room, as its name suggests, is the dressing room behind the hall but it is much more than that. 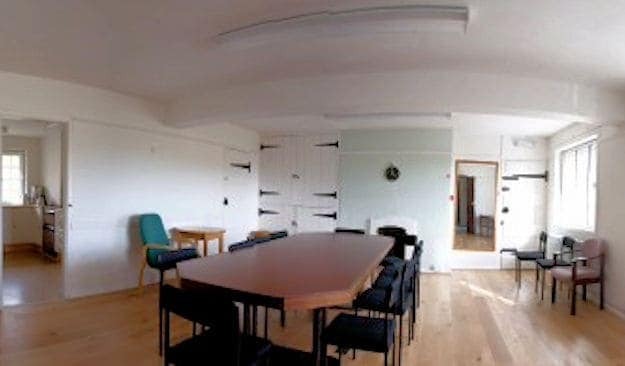 It is a bright regular shaped room (measuring 6m x 5.4m) that is ideal for small groups or meetings for up to 20 people. It can also be used for exhibitions. It has the added bonus of a fully fitted kitchen. The Green Room and the Cotswold Room are on the first floor at the front of the building reached through a door shared with the Gardiner Room and the Artist Studios. There is a new stair lift for the disabled to visit these rooms. The Green Room is often hired in conjunction with the Cotswold Room, providing space for up to 70 people and the benefit of being able to provide hot drink and catering options.